American Heroes Saltwater Challenge brings vets to the Island to relax and heal. It was a dark and stormy night when the group of seven wounded warriors made their way out to Chilmark for the start of the ninth annual American Heroes Saltwater Challenge. The group, which included Army Sgt. Chris Gottschling, Army Capt. Jason Hawreluk, Army Maj. Joey Hutto, Marine Corps Staff Sgt. Rafael Lopez Jr., Marine Corps Crp. Michael Mack, Army Capt. Michael Vieira, and Marine Corps Capt. Kevin MacDevette, was treated to a warm welcome last Monday night. The veterans hailed from every corner of the country — Texas, Washington state, Alabama, North Carolina, Connecticut, Pennsylvania, and, conveniently in the case of Mr. MacDevette, Martha’s Vineyard. As the rain battered the roof of the Beach Plum Inn, the group was welcomed with the singing of the National Anthem by the MVRHS Minnesingers, a salute from members of the American Legion, handshakes from numerous fishing charter captains, and a delicious spread of food that included refreshing lobster rolls and hamburgers piled high with tri-colored tomatoes. 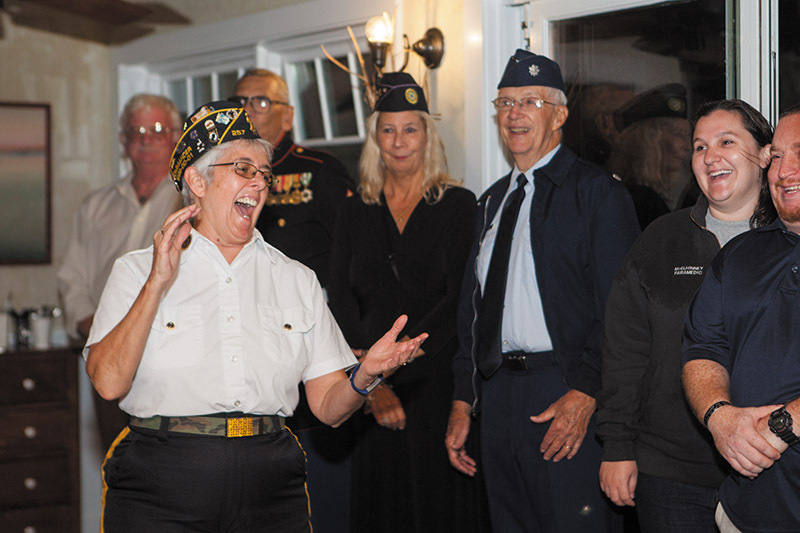 “I know you’ve heard this story a thousand times but it doesn’t get old to me,” said Sarah Nixon, who owns the Beach Plum Inn with her husband Bob Nixon, in her welcoming remarks to the veterans and volunteers. Ms. Nixon shared the oft-told tale of how her son saw an article about wounded vets returning home and, as a dedicated fisherman, wanted to share his love of the Derby with them. 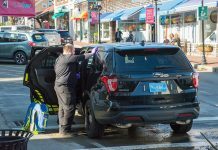 His humanitarian vision sparked action and the creation of the event, which has brought many wounded warriors to the shores of Martha’s Vineyard for a healing experience. As in years past, this year various members of the community stepped up to donate their time, goods, or services to create an unforgettable experience. 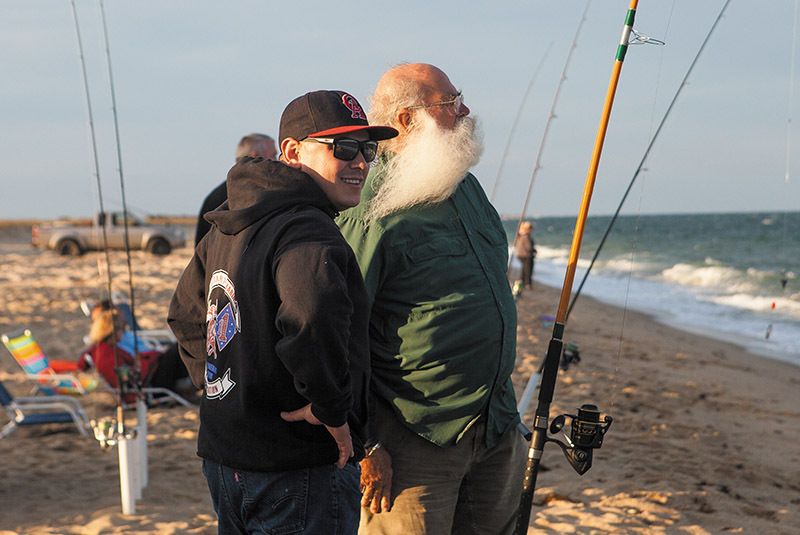 Over the next three days, the veterans and their family members were treated to the hospitality of the Beach Plum Inn, two days of boat fishing, sunset surf casting lessons, beachside barbecues, and the thrill of weighing in their catches at the Derby weigh station. 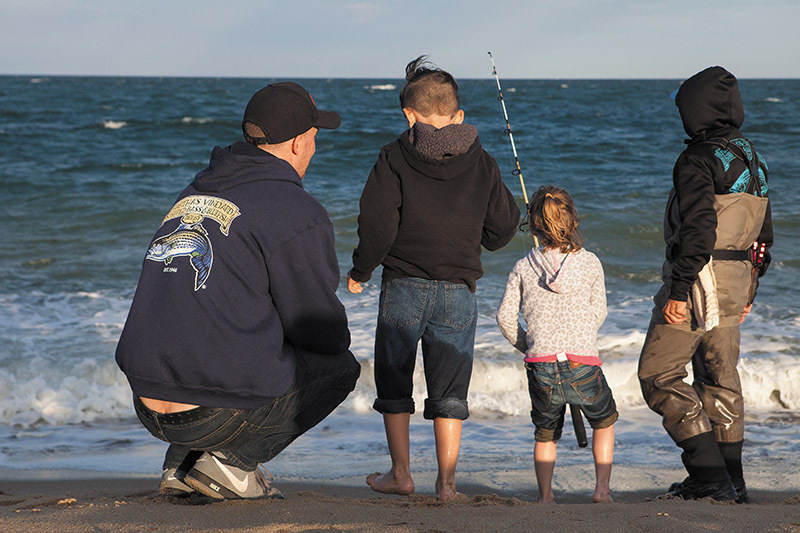 On Tuesday, the the vets and their families were paired up with a charter captain to fish the waters off Martha’s Vineyard. Captains Buddy Vanderhoop, Scott McDowell, Jennifer Clarke, Jonathan Boyd, Chip Vanderhoop, and Joe El-Deiry were on hand to provide the vets with an unforgettable fishing experience. Mr. Lopez made a name for himself by securing a grand slam win on Joe El-Deiry’s boat. 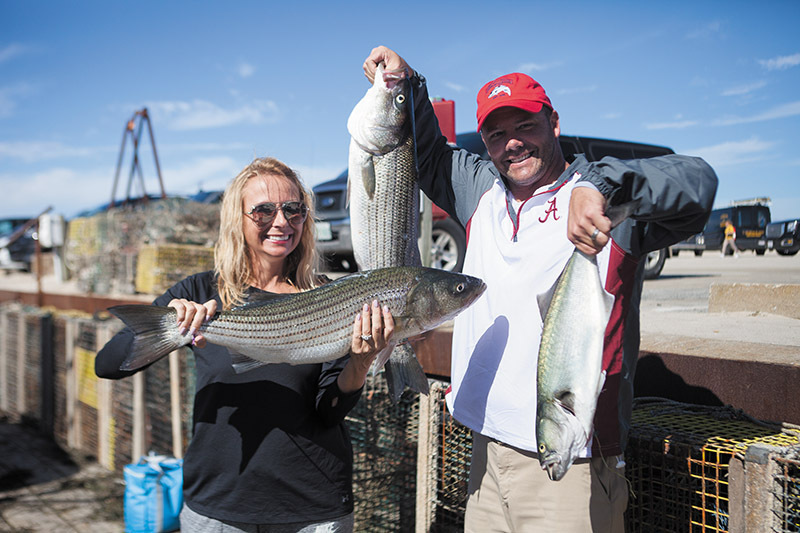 On Tuesday, Mr. Hutto and his wife Michelle returned to Menemsha carrying quite a haul of fish, which they were excited to weigh in. 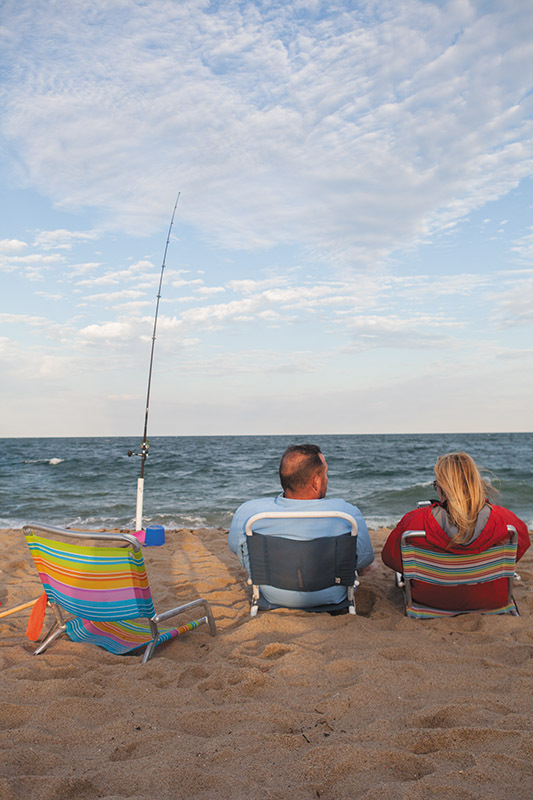 Wednesday ended with an evening of fishing and barbecuing at East Beach on Chappaquiddick. 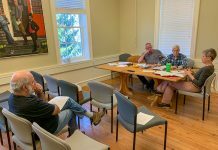 The atmosphere was that of a well-attended and long-awaited family reunion. Janet Messineo was on hand to provide fishing lessons, which were well-utilized by Aiden and Ilithyia Mack. Mr. Mack’s smile seemed like a permanent fixture as he carefully doted on his children, throwing out line after line in the foaming surf. Back at the buffet table, Derby grand slam winner and 13-year Marine Corps veteran Mr. Lopez expressed his gratitude for the experience and thanked everyone who made it possible. Like many of the other vets selected for the challenge, he was confounded when he heard the news. “There are guys that are less fortunate than I am,” he said. A combination of disbelief and modesty made it hard to accept the offer, but in the end he was honored to be a part of it. As the fading sun cast its rays on the backs of the vets and their families on Wednesday, a large spread of food was spread out on the beach for the hard-working fishermen. The vets stood around swapping stories and sharing laughs well into the night, breathing deep as they prepared to take home a little piece of the Vineyard.